Unlike bots, trolls are actual people using social media to sow discord or spread false information. The name originated as a term for any person on the Internet taking advantage of anonymity to pick fights, bully, or annoy others simply for the sake of, well, being a nuisance. Recently, they have made headlines for much more organized sinister behavior: the Russian government has hired thousands of ‘trolls’ since 2014, some of which were involved in manipulating US voters during the 2016 election by pushing socially divisive issues and misleading information. Whether a random jerk online or someone working for a larger organization such as the IRA, trolls are generally associated with promoting chaotic situations. In a newly reported case of a fringe Iranian opposition group, however, the trolls have a very specific goal in mind. One of Donald Trump’s oft-repeated attacks against the US foreign policy establishment, and by extension, Hillary Clinton, was of the decision for regime change in Iraq in 2003. Yet, the Trump administration’s efforts at pushing for regime change in Iran have been strangely similar to the misinformation campaign that led the US into Iraq. A major difference is this time the administration has a new tool on its hands: social media. The Mujahedin-e Khalq, founded in 1965 as an opposition group to the Iranian shah, was initially opposed to the US. It participated in the 1979 storming of the US embassy in Tehran that held 52 Americans hostage for over a year. 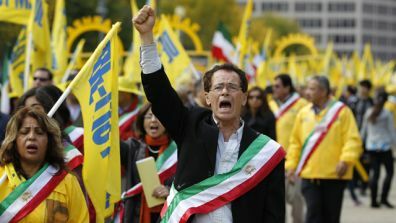 After the 2003 US invasion of Iraq, the MEK switched to lobbying the US in the hopes of enacting the same outcome of regime change in Iran. 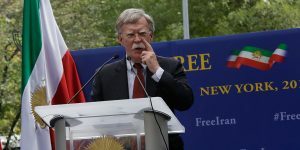 The MEK has lobbied a large number of US government officials, but no one advocates for them as vocally as Trump’s current National Security Advisor John Bolton. Bolton is now infamous for pushing for regime change in Iraq while US Ambassador to the UN. He has given countless speeches for the MEK. This includes one for $40,000 in Paris in July, 2017. In December, 2017, Tehran erupted in protests larger than any since the Green Movement in 2009. Considered by many to be a moderate reformist himself, current President Rouhani campaigned on better relations with the West, overseeing the 2015 implementation of the nuclear deal. As the economy remains stalled and political repression still rampant, however, discontent remains high. Blaming opposition movements on foreign elements is a tried and true tactic of authoritarian governments, and Iran is no exception. 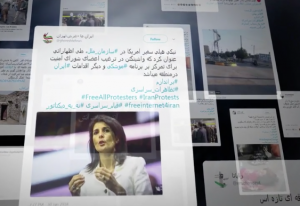 Nonetheless, we now have evidence that the MEK—backed by the governments to whom Iran attributes blame—actively took measures to enlarge the protests through social media. Former members from a ‘troll farm’ in located in Albania have been using thousands of fake Twitter accounts to promote regime change in Iran. Trolling is not the only tactic used to inflame the Iranian protests. One video widely distributed for the protests was really from pro-democracy protests in Bahrain during the Arab Spring. Those protests were unprecedentedly large. With women clad in black abayas, it made for a scene that they unsuspecting viewer would easily mistake for Iran. Blaming opposition movements on foreign elements is a tried and true tactic of authoritarian governments, and Iran is no exception. In fact, the Iranian Revolutionary Guard has been able to justify its brutal crackdown on all protestors by attributing protests to foreign meddling by the US, Israel, and Saudi Arabia. Given the fact that the MEK is involved, and has known financial and blatant political support from members of the Trump administration, these accusations are not incorrect. As for Iranians, they are all too familiar with foreign-backed regime change in their country.